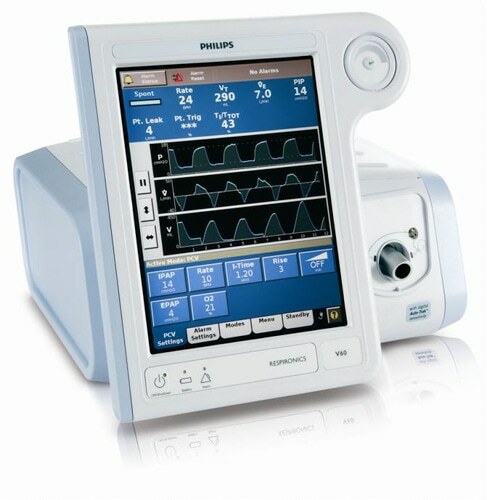 The Respironics V60 uses Auto-Trak technology to help ensure patient synchrony and therapy acceptance. By providing auto-adaptive leak compensation, inspiratory triggering, and expiratory cycling, Auto-Trak delivers optimal synchrony in the face of dynamic leak and changing patient demand. The V60 supports this critical step in NIV with an expansive color touchscreen and pre-defined settings for Respironics hospital masks. You select the setting, and the V60 automatically calibrates flow characteristics for better monitoring and therapy.